GREENBAY, WI. — Over 67,000 fans showed up to Lambeau Field on July 18 to honor former Green Bay Packers quarterback Brett Favre being inducted into the Packers hall of fame. 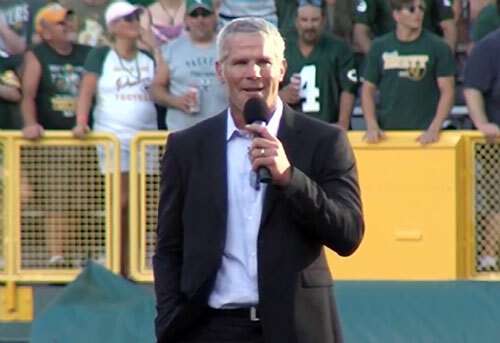 An emotional Favre delivered a heartfelt speech. “All I can say is wow, wow … This is absolutely amazing. I don’t have the words to express the feeling coming out of that tunnel to this ovation … where else can you get this many people in a stadium when there isn’t a game … nowhere … I could sit here and tell you thank you until tommorrow and it wouldn’t be enough. 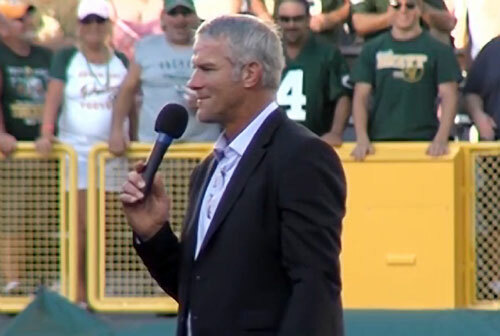 Watch Brett Favre’s emotional return to Lambeau field. Brett Favre was a two-time Super Bowl champ and three-time NFL MVP during his career with the Green Bay Packers from 1992-2007. Favre, who spent the most of his career with the Green Bay Packers, was a 20-year veteran of the NFL, having played quarterback for the Atlanta Falcons (1991), Green Bay Packers (1992–2007), New York Jets (2008) and Minnesota Vikings (2009–2010). He is the only quarterback in NFL history to throw for over 70,000 yards, over 500 touchdowns, over 300 interceptions, over 6,000 completions, and over 10,000 pass attempts. On January 17, 2011, Favre officially filed his retirement papers with the NFL. Today Brett Favre is also a popular motivational speaker. If you would like to book football speakers or professional athletes like Brett Favre for a speaking engagement, autograph signing, product endorsement, fundraiser or special event, contact Brett Favre’s booking agent for appearance and speaker fees at Sports Speakers 360. For booking agent and appearance fees and costs on how to book Green Bay Packers players for appearances, call 1.855.303.5450.